Louisa County is located in the Central Piedmont region of Virginia near the geographic center of the state. Louisa is just 15 miles west of Greater Richmond, the state capitol, and 15 miles east of Greater Charlottesville, home of the University of Virginia. 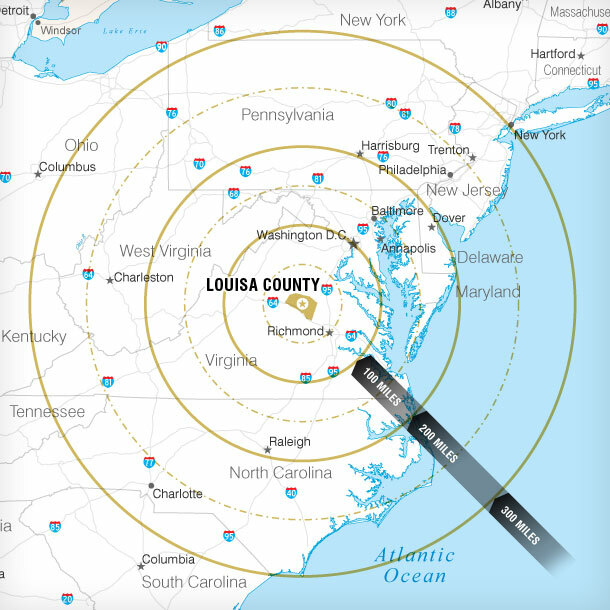 Louisa County is located just 90 miles south of the nations capital and 140 miles northwest of the port city of Norfolk. The county’s 517 square miles are a mix of residential, historic farms, open pasture and wooded area. Increasingly the business community is finding Louisa to be an attractive central location for manufacturing and commercial investment.